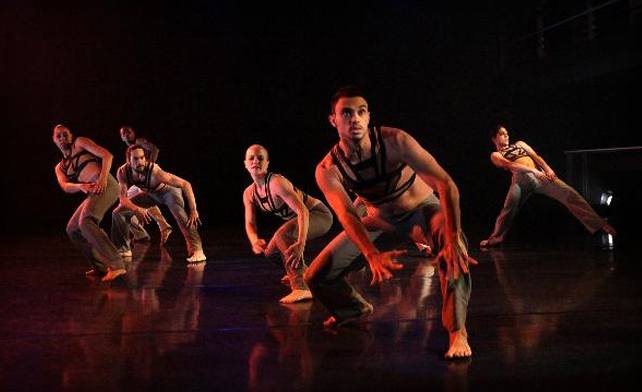 Bangarra is a dance theatre company that visibly breathes. Lighting, soundscapes, imagery and movement come together to create a work of art that is both reflective and provocative. Shifting our gaze above, below and within, Of Earth and Sky is the start of a new cycle heralding Bangarra’s 21st year as Australia’s premier performing arts company into a brand new decade. After the sell out success of Fire in 2009 this year’s double bill is a spectacular culmination of stunning visual art used in very different mediums and illustrated by a troupe of talented dancers who navigate a highly topological story space. Choreographer Daniel Riley McKinley draws his inspiration for Riley from photographer and film maker Michael Riley’s cloud series, a collection of images whose ‘beautiful blue backgrounds and symbolic almost totemic subjects’ were instrumental not only in setting the stage for the first act but in allowing McKinley to offer perspectives through his own creative interpretations. As the youngest choreographer to contribute to Bangarra’s dance theatre repertoire McKinley creates a sustained and engaging work that when combined with the electronic and experimental soundscapes of David Page is quite a thrilling experience. With six images from Michael Riley’s cloud series forming the dominant set piece the ensemble transformed the stage. The ‘Locust’ section was especially powerful as the swarm of dancers inhabited the bodies of the insects as well as those who are affected by it. The striking movements, the buzz and tremor of the landscape as it vibrated with the invasion and defence of these attacks was superbly executed by the ensemble and along with the exquisite movements of Waangenga Blanco and Leonard Mickelo in the section ‘Angel’ were definitely stand out moments. One of the unique aspects of Riley was that it had a very clear culmination, the section entitled feather was imbued with the significance of Michael Riley’s own passing (in Wiradjuri culture a feather can represent the marking of a journey) and as the dancers gracefully left behind feathers as they made their exit the personal significance McKinley shares with Riley and with his own Indigenous heritage is made abundantly clear, a connection that we are privileged to witness. Artefact, the second act of Bangarra’s double bill once again transformed the stage but this time the story was grounded towards the earth with choreographer Frances Rings explaining that Artefact is about ‘breathing life back into the object’. Opening with the section entitled ‘Museum’ our attention is focused on a magnificent possum skin, a cloak, a shelter, a timeless presence that now is locked away behind glass yet the spirit of it continues to speak. Visually arresting the possum cloak lead the way to other equally stunning sections: ‘String Bags’, ‘Grinding Stones’, ‘Bodies’, ‘Coolamun’ and ‘Weaving‘ that highlighted the value and importance that these objects have for the Indigenous people and the stories that resonate as deeply in the present as they did in the past. ‘Grinding Stone’, a piece about the stone tools that were used throughout Australia is powerfully performed by all the male members of the ensembles and carried a distinctive aura of how vital these objects have been in the past and their continued role into the present. Balanced by an all female ensemble piece ‘String Bags’ is also eloquent in transporting us back into the past to become reacquainted with the intimacies of these objects that once were so full of life and meaning and now have been separated into objects of the external gaze. Both Riley and Artefact are visually spellbinding and the use of the set, props and projection is a credit to Jacob Nash whose creativity lent itself towards breathing life into this amazing performative work paying homage to the traditions of Indigenous people.